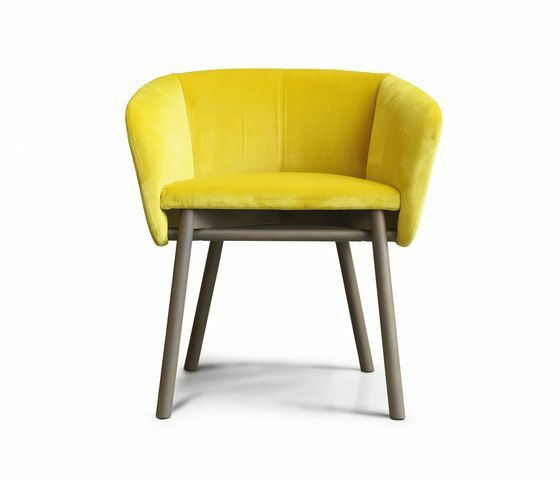 The deep, rounded seat encourages relaxation and conversation. The perfectly balanced volume of the body matches impeccably with the characteristic support frame, thus redefining the typical "tub" chair. The internal plywood body and the polyurethane and Dacron upholstery, flanked by a beech frame, provide excellent comfort. Balù comes in many colour variations and neutral or tone-on-tone shades, in line with the collection colours. Balù is can be used in any space, such as meeting rooms, small conference rooms and reading rooms, as well as domestic environments such as living rooms, study areas and bedrooms, which require performance combined with comfort and a strong personality. The Balù chairs, available in a variety of finishes and upholsteries, may be freely combined together, both at home and in public areas. Dimensioni: L 69 cm | P 57 cm | H 74 cm Materiali: struttura in faggio Colori: faggio naturale sbiancato, cacao polveroso, grigio stagno o colori laccati Rivestimento: velluto, tessuto, pelle e ecopelle. There are new versions of Balù, the deep and rounded chair that invites relaxation and conversation. The perfect balance between the volume of the body and support structure is enhanced by details that increase its comfort, with new materials, colours and many potential combinations. A wide range of colours is offered for its upholstery. Covered in flame retardant fabrics like wool, velvet or leather or imitation leather, it is suitable for both home and or contract furnishing areas.